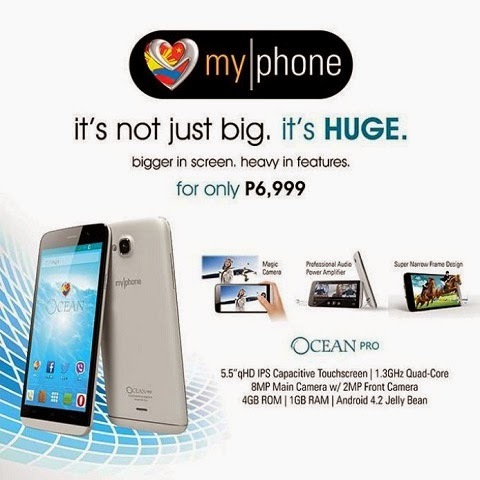 MyPhone outs another affordable phablet this time tagging it as Ocean Pro. This sub-7K device has dual-SIM capabilities and will be powered by a 1.3-Gigahertz quad-core CPU and 1GB of RAM. It has an ample screen real-estate which measures 5.5-inch. The screen is treated with a qHD IPS display that sums up to 200 ppi pixel density. For mobile photographers, the MyPhone Ocean Pro will have an 8-megapixel rear shooter and 2-megapixel front shooter. The device will be powered by Android 4.2 Jelly Bean and 2350 mAh battery. Check out the rest of the specs after the jump.